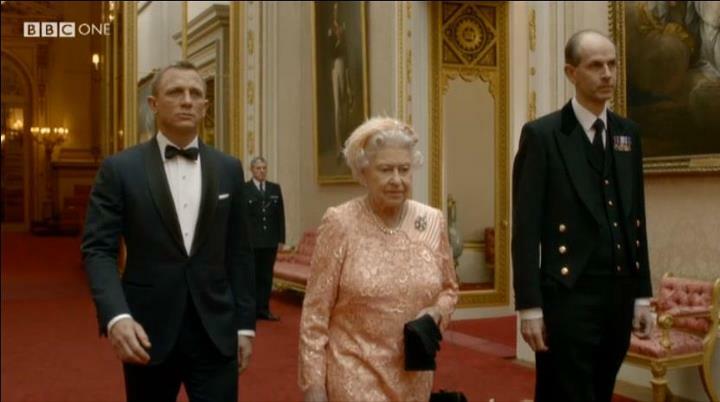 The pièce de résistance of the just-wrapped, Danny Boyle-directed London 2012 Olympics opening ceremony was undoubtedly the pre-taped scene in which British actor Daniel Craig, in character as James Bond 007, got to live out his 'On her Majesty's secret service' mandate by meeting real-life Queen Elizabeth II at Buckingham Palace. After a few corgi cameos, the duo then embarked on an amusing, mocked-up chopper ride and paraglider "drop" into the Olympic stadium. This time, of course, it wasn't quite so secret, with the ceremony watched by an estimated one billion. Craig looked ultra sharp, in an impeccably–tailored tuxedo (below) that would have been a fabulous plug for one of Britain's greatest sartorial exports – bespoke Savile Row tailoring. But was it British tailoring – or American? 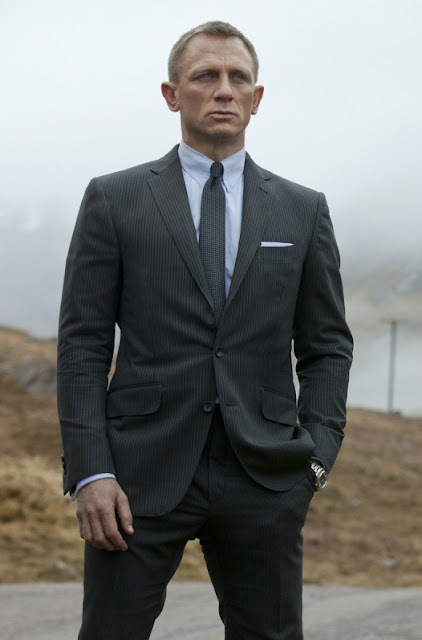 Ford is the latest Bond tailor. In fact, Britain has not kitted out the James Bond character for almost 20 years - as visitors to the Designing 007: Fifty Years of Bond Style retrospective, which is on at The Barbican in London until September 5, would be able to attest. British bespoke tailors such as Turnbull & Asser, Anthony Sinclair and Cyril Castle originally provided suits for Sean Connery, George Lazenby and Roger Moore. When Pierce Brosnan took over the role in 1995, Brit tailoring was swapped for its equally illustrious Italian counterpart, with the film studio striking a deal with the Brioni brand. Craig was outfitted by Brioni for his first Bond film, Casino Royale in 2006, but turned to Tom Ford on Quantum of Solace in 2008. The duo also worked together on the upcoming 23rd Bond film, whose title is - by hilarious coincidence - Skyfall. The film has been produced by Eon Productions for MGM, Columbia Pictures and Sony Pictures. "Tom's doing the suits. In fact, I've spent a long time with Tom getting a very different look and he's been designing a new set of things [for the film]. It's great that he's doing it. It's going to be a new kinda look. It's a new feel. I'm very excited about that" Craig reportedly told reporters at the New York premiere of The Girl With a Dragon Tattoo in December last year, adding that he got to take the suits home after the shooting wrapped. Of his personal style, Craig noted, "I've kind of flipped the other way and if I could just wear jeans and T-shirts all the time I would. But that doesn't mean I don't like getting dressed up. I'm really lucky to have a wardrobe with five or six beautiful suits done by Tom and some other people. So when the time is right, I put them on, and they're beautiful". In a statement issued in November 2011, Ford noted: "I could not be happier to be dressing Daniel Craig again in the next James Bond film. James Bond epitomizes the Tom Ford man in his elegance, style and love of luxury. I am thrilled to move forward with this iconic character”. Texas-born, Ford first came to prominence as a designer in the mid 1990s, when he revitalised the Italian luxury brand Gucci. After leaving Gucci in 2004, he launched his own luxury menswear line and boutiques and a beauty brand for both men and women, only recently venturing back into womenswear. Skyfall is due to be released in late October in the UK – at, it looks like, exactly the same time that Ford opens his first British standalone boutique.